A family grouping: mother and older sister holding up a toddler boy child as he struggles to walk, tottering toward his outstretched crouching father, a milkmaid ambling by in the background, balancing a brimming bucket. Harper’s Magazine article by Lawrence Weschler – June, 05. David Hockney argues that in the age of the camera, Rembrandt’s drawing of a family teaching a child to walk is still the best ever made. 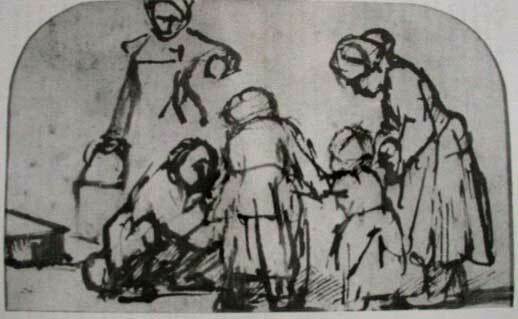 Rembrandt’s drawing of a family teaching is smallest member to walk is, I think, the best drawing ever made. First of all, its subject is one that every viewer knows and has experienced. More than likely everyone has observed a seen like this, no matter where in the world they live. Rembrandt van Rijn, A child being taught to walk; two girls, seen from behind, supporting the child on either side, a figure seated on the ground at left encouraging the child, a woman standing behind with a pail. c.1656. Pen and brown ink on brownish-cream paper. My friends tell me it takes time to see how good this drawing is and the British museum, who look after it, tell me people walk past it when it’s in the galleries. The child is being held by her mother and older sister. The mother grips the child firmly, the sister more hesitantly, and Rembrandt observes her looking at the child’s face to see how anxious she is, the lines of her shoulders beautifully indicate this, Rembrandt even turned his pen round and scratched through the ink to emphasise it. It makes me then see the child’s face, a hint of worry in it, indicated only by one or two faint marks. One then begins to look at ink, not mothers and sisters , and marks made by a hand, speedily. The trace of Rembrandt’s hand is still alive. One’s eye can go back and forth between brown ink – sister; fast mark – mother. How beautiful to do this, from the physical surface of the paper to its disappearance when one reads the ‘subject’, and then back again. How many marvellous layers does this drawing have? The mother has a double profile, Picassoesque. Was it an accident with the pen that he then used as a master would? Both profiles are fascinating about her character. Her skirt is a bit ragged, without any real detail, one seems to know this, and then marvels at how these few lines suggest that. Now one is beginning to realise this is a virtuoso drawing – something that was not shouted out – the depiction of human tenderness came first. Sensing the powerful triangle made by the crouching father, who has excited eyes that are two beautiful ink blobs, one realises the quite complex space the figures make. But then, there’s a passing milkmaid, perhaps glancing at a very common scene, and we know the milk pail is full. You can sense the weight. Rembrandt perfectly and economically indicates this with, what? Six marks, the ones indicating her outstretched arm. When I look at these marks, I know a Chinese master of the seventeenth century would recognise instantly that this drawing was the work of a master. Very few people could get near this. To return to the subject again. Most people today try to depict this with snaps of video. Yet in painting only the greatest artists have dealt with this subject. Picasso, Van Gogh, Millet. Is it too ordinary? Too sentimental? This is not just a picture of a caring little family, it’s Rembrandt’s account of seeing them. A video of this subject would be mostly a performance, as most things are in front of cameras. It’s when one thinks of the millions of photographs made of this subject today, that the drawing becomes even more interesting. The tenderness this drawing shows is not possible with photography. This entry was posted in MAMO Research. Bookmark the permalink.